Start Music Tag and add some music files. Select a file that needs cover art. Click the "Download Artwork" button. Click "Yes" to apply the updated artwork to your track. As well as allowing you to download tag data directly from the database, and allowing you to edit existing tags on the file, Music Tag also allows you to use the data present on the tags to download, restore and remove artwork based on the data on display, which you can edit. 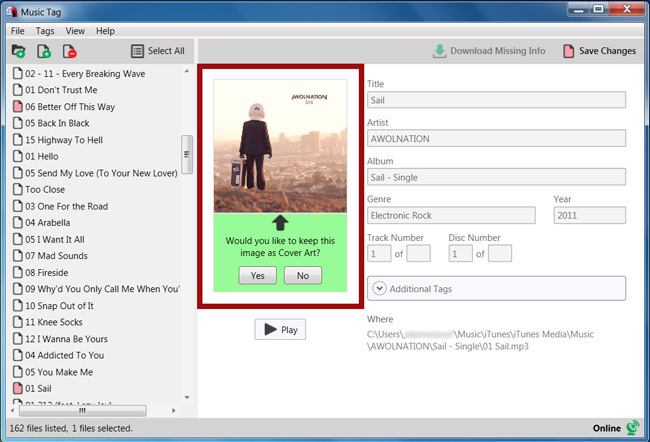 Should you wish to retrieve cover art for a file that already contains tag data, or if you wish to add the tag data yourself, then you can click the Download Artwork button underneath the Artwork Display box, and Music Tag will attempt to download the Artwork for the specified Artist, Song Title and Album. The program will then prompt you once it has retrieved the data. Ensure that the track information is as accurate as possible before attempting to match album artwork. This will give Music Tag the best chances of finding a match for your track. If you press Yes, the Cover Art will have changed. If you press No, the cover art will return to the file's default. If you would like an existing image to be removed and left blank, then you can use the remove artwork button to do just that. Changes won’t be permanent until you save. If you would like to add your own cover art from a file on your computer, hit the "Load artwork from file" button. 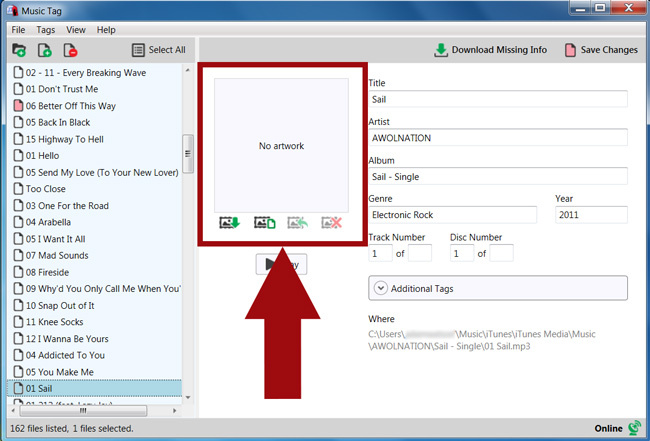 Locate your image file, and save it to your music track. Should you at any time wish to revert the artwork back to the file’s default, clicking the revert artwork button will set the image to whatever is defined as the image on the file. You can also click on the image on display to have it appear in fullscreen.